The purpose of the present study is to determine whether airway pressure release ventilation (APRV) can safely enhance hemodynamics in patients with acute lung injury (ALI) and/or adult respiratory distress syndrome (ARDS), relative to pressure control ventilation (PCV). Mean age was 58 ± 9 years (n = 12) and mean Lung Injury Score was 7.6 ± 2.1. Temperature and arterial oxygen tension/fractional inspired oxygen (FiO2) were similar among the patients. Peak airway pressures fell from 38 ± 3 for PCV to 25 ± 3 cmH2O for APRV, and mean pressures fell from 18 ± 3 for PCV to 12 ± 2 cmH2O for APRV. Paralytic use and sedative use were significantly lower with APRV than with PCV. Pressor use decreased substantially with ARPV. Lactate levels remained normal, but decreased on APRV. Cardiac index rose from 3.2 ± 0.4 for PCV to 4.6 ± 0.3 l/min per m2 body surface area (BSA) for APRV, whereas oxygen delivery increased from 997 ± 108 for PCV to 1409 ± 146 ml/min for APRV, and central venous pressure declined from 18 ± 4 for PCV to 12 ± 4 cmH2O for APRV. Urine output increased from 0.83 ± 0.1 for PCV to 0.96 ± 0.12 ml/kg per hour for APRV. APRV may be used safely in patients with ALI/ARDS, and decreases the need for paralysis and sedation as compared with PCV-inverse ratio ventilation (IRV). APRV increases cardiac performance, with decreased pressor use and decreased airway pressure, in patients with ALI/ARDS. The optimal method of ventilating and oxygenating patients with ALI or ARDS remains a hotly debated topic. Recent advances in lung injury research have refocused clinical attention on reduced tidal volumes and limited peak airway pressures in order to diminish the impact of gas delivery to lungs with abnormal compliance, volume, and regional time constants . Despite such focus, the benefits of a pressure-limited or volume-limited strategy for ALI remain controversial . From the midst of multiple competing methods, the open lung model of ventilation has surfaced as a method to titrate both tidal volume and peak airway pressures, as well as positive end-expiratory pressure (PEEP) to an individual's lung mechanics . Inherent in this model is an understanding of both the dynamic and static pressure-volume curves - a frequently problematic concept application. Moreover, it is difficult to generate a static pressure-volume curve in clinical practice. Therefore, the active clinician remains at a loss for an easily understandable and deployable system by which to establish oxygenation, clear carbon dioxide, and optimally monitor the patient's response to the ventilatory strategy. One alternative is APRV. APRV is essentially a high-level continuous positive airway pressure (CPAP) mode that is terminated for a very brief period of time. It is this short release period that allows carbon dioxide to be cleared. The lengthy time during which the high-level CPAP is present results in substantial recruitment of alveoli of markedly different regional time constants, at rather low gas flow rates and lower airway pressures. The establishment of intrinsic PEEP by the short release time enhances oxygenation. Carbon dioxide clearance is aided by recruitment of the patient's lung at close to total lung capacity; elastic recoil creates large volume gas flow during the release period. This mode is fundamentally different from cyclic ventilation. It allows the patient to breathe spontaneously during all of the phases of the cycle. Given the spontaneous nature of the mode, it is hypothesized that there should be no need for continuous infusions of neuromuscular blocking agents in patients placed on this mode of ventilation. This may result in a shorter duration of intensive care unit (ICU) stay and a reduced incidence of prolonged neuro-muscular blockade syndrome. Furthermore, because patients may be ventilated at lower airway pressures than are required with cyclic ventilation, there may be a reduced need for pressor support of hemodynamics to ensure oxygen delivery. The present exploratory study was conducted to investigate these issues in a patient population with severe lung injury who required inverse ratio PCV for oxygenation failure. We found that APRV safely oxygenates and ventilates patients at lower airway pressures, virtually eliminates the need for neuromuscular blockade, and reduces the need for pressor support and sedation, while improving oxygen delivery in patients with ALI/ARDS. Patients in a mixed medical/surgical ICU of a tertiary care university hospital with ALI/ARDS and an indwelling pulmonary artery catheter (PAC) formed the subject group. These study patients represent a convenience sample. All of the patients were ventilated using IRV-PCV, with both upper and lower inflection points eliminated from the dynamic pressure-volume curve. Curve determination was performed using a Pediatric-Adult Star 2000 Ventilator (Infrasonics Inc, San Diego, CA, USA), with an integrated waveform package. Setting changes were titrated to the on-screen waveform appearance. Ventilator settings in PCV achieved a partial carbon dioxide tension of 35-45 torr and a partial oxygen tension greater than 60 torr on an FiO2 of 0.60 or less. The patient ventilator was then changed from the Adult Star ventilator to the Evita4 Pulmonary Workstation (Drager Medizintechnik GmbH, Lubeck, Germany) with identical settings.All study patients were maintained on continuous infusions of an analgesic and a sedative. Some patients were also maintained on continuous infusions of a neuromuscular blocking agent. Daily assessment of the need for pharmacologic relaxation was performed by protocol. After allowing a 30-min period of equilibration, patients were then switched to APRV mode. Initial high-level CPAP settings were selected as 75% of the prior PCV-generated peak airway pressure. The initial duration at the high CPAP (Thigh) was selected arbitrarily as 4.5 s. The initial release time (Tlow) was arbitrarily set at 0.8 s. No lower limit pressure during the release phase was set. The FiO2 was not altered. The Evita4 ventilator parameters were then titrated to the expiratory portion of the airway pressure curve (Fig. 1), arterial blood gas (ABG) values for carbon dioxide clearance, and the arterial oxygen saturation to achieve comparable ventilation and oxygenation. Airway pressure and flow as a function of time using the Drager Evita 4 Pulmonary Workstation in APRV mode. Note that the upper tracing indicates airway pressure, while the lower trace represents flow over time. The airway pressure is held relatively constant, while the patient is able to breathe spontaneously. The interruption in the airway pressure trace marks the airway pressure release phase, and is short relative to the time spent at the higher pressure. Reproduced with permission from Drager, Inc.
Neuromuscular blocking agents were discontinued and assessed by a train of four stimulus at 50 mA on changing to APRV. Patients who recovered a complete train of four were no longer considered pharmacologically blocked. 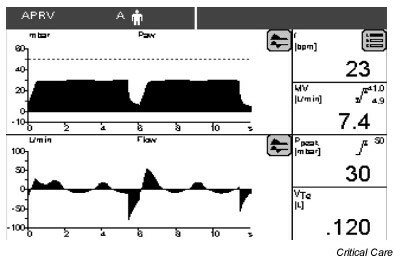 Hemodynamic profiles, as well as ABG and lactate values, were obtained immediately after changing to APRV. Patients whose neuromuscular blocking agents were successfully discontinued (ie recovery of a train of four) had hemodynamic and laboratory values measured 30 min after changing to APRV in order to assess the adequacy of carbon dioxide clearance and perfusion. Patients who remained pharmacologically blocked after 60 min of having their blocking agent discontinued were excluded. Sedative agents were titrated to a stimulated bispectral index (BIS) value of 70 (range 65-75) on a pre-existing protocol during neuromuscular blockade. Sedatives were titrated to the BIS and patient comfort when neuromuscular blocking agents were discontinued. Patients were then continued on APRV or returned to PCV, according to the preferences of the treating physician. Abstracted data common to all patients included age, diagnosis, chest radiograph interpretation, ventilator settings, hemodynamic profiles, ABG, lactate, inotropic agents, neuromuscular blocking agents, sedatives, complications during the transition from PCV to APRV, and urine output. Data (means ± SD) were compared using a two-tailed Student's t-test (mean values) or Χ2 (percentage) as appropriate. P < 0.05 was considered statistically significant. One author (VF) was a respiratory therapist at the study site before transition to the sponsoring ventilator company. Following the transition that author had no patient contact, but participated in data analysis. The results are summarized in Table 1. Mean age was 58 ± 9 years (n = 12) and mean Lung Injury Score was 7.6 ± 2.1. Temperature (PCV 100.8 ± 1 versus APRV 100.6 ± 1°F; P > 0.5) and arterial oxygen tension/FiO2 ratio (PCV 168 ± 24 versus APRV 182 ± 18; P > 0.05) were similar. Admitting diagnoses were pneumonia (22%), intra-abdominal sepsis (45%), trauma (33%), bloodstream infection (18%), and transfusion-related lung injury (1%). With the change from PCV to APRV, peak airway pressures fell from 38 ± 3 cmH2O (PCV) to 25 ± 3 cmH2O (APRV; P < 0.01). Similarly, mean airway pressures fell from 18 ± 3 cmH2O (PCV) to 12 ± 2 cmH2O (APRV; P < 0.01). No patients sustained any untoward complications during the transition from PCV to APRV. Values are means ± SD, or percentage, as indicated. Mean values were compared by two-tailed t-test, whereas percentages were evaluated using Χ2 tests. CVP, central venous delivery; DO2, oxygen delivery; Pawmean, mean airway pressure; Pawpk, peak airway pressure. Neuromuscular blockade (vecuronium, cis-atracurium) use (PCV 74% versus APRV 4%; P < 0.01) and use of sedatives (lorazepam, midazolam; PCV 100% versus APRV 68% of PCV dosage; P < 0.01) declined significantly with APRV. The one patient who required continued neuromuscular blocking agents had sustained a severe traumatic brain injury, and exhibited unmanageable intracranial pressure values while off neuromuscular blocking agents. Pressor (epinephrine, norepinephrine) use decreased substantially (PCV 92% versus APRV 45% of patients; P < 0.01). Lactate levels remained normal, but declined significantly on APRV (PCV 2.2 ± 0.4 mmol/l versus APRV 1.8 ± 0.3 mmol/l; P < 0.01). The mean cardiac index rose from 3.2 ± 0.4 l/min per m2 BSA (PCV) to 4.6 ± 0.3 l/min per m2 BSA (APRV; P < 0.01), whereas oxygen delivery increased concomitantly from 997 ± 108 ml/min to 1409 ± 146 ml/min (PCV versus APRV; P < 0.01). In association with these changes, the CVP declined from 18 ± 4 cmH2O (PCV) to 12 ± 4 cmH2O (APRV; P < 0.01). Mixed venous oxygen saturation (SvO2) remained relatively constant between the two modes of ventilation (P = 0.22). Urine output, however, increased during the time period on APRV (0.96 ± 0.12 cc/kg per h; P > 0.01) as compared with the immediately preceding 1 h (0.83 ± 0.1 cc/kg per h). This pilot study focuses on a select group of patients with a severe lung injury and concomitant oxygenation failure. Moreover, this small group of patients all had an indwelling PAC for guidance of intravascular volume and/or pressor support of oxygen delivery. All of the patients had normal lactate levels and cardiac indices that exceeded 3 l/min perm2 BSA. These values were taken as acceptable markers of adequate perfusion and thorough resuscitation, thus establishing a patient population that was believed to be relatively stable. The causes of the severe lung injuries in the patients were diverse, as one may expect in a mixed medical-surgical ICU, which attests to the protean nature of the underlying disorders that may result in lung injury. The primary questions that the present study addresses are as follows: whether patients with a severe lung injury requiring inverse ratio PCV may be safely transitioned to APRV; whether APRV allows patients with a severe lung injury on IRV-PCV and neuromuscular blockade to be safely ventilated without neuromuscular blockade; whether transitioning to APRV allows patients to be treated with less sedation as compared with IRV-PCV; and whether APRV improves hemodynamic performance in patients with severe ALI/ARDS as compared with IRV-PCV. An early trial in open-heart surgery patients  documented that patients on other forms of CPAP ventilation may be safely switched to APRV. However, the result from that study may not be directly applicable to patients with severe lung injury. The present trial clearly demonstrates that such transitioning is safe and well tolerated, even by patients with inverse ratios approaching 4:1. Importantly, such a transition is better tolerated by many patients than was the original mode of mechanical ventilation with regard to systemic oxygen delivery (Table 1). A more recent trial  evaluated ARPV in patients with ARDS who were sufficiently well to be supported entirely on pressure support ventilation. This group and the one studied here share similar findings, despite the differences in the degree of lung injury when APRV was instituted. In both studies, hemodynamics were improved by APRV. Importantly, we found that the beneficial effects of APRV were related to the spontaneous breathing component as demonstrated by improved alveolar recruitment. Because APRV is a modified form of CPAP, spontaneous breathing is an essential characteristic of the mode. Otherwise, APRV becomes nothing more than PCV with rather long inspiratory times and huge inspiratory : expiratory ratios. It is not uncommon to establish an 'inspiratory : expiratory ratio' of 13:1 using APRV. The inspiratory : expiratory ratio, however, is misleading during spontaneous breathing on APRV. This is because the patient may breathe throughout the entire phase time for each alternation of Thigh and Tlow at their respective pressures (Fig. 1). Thus, neuromuscular blockade should be eliminated to achieve the full potential benefits of APRV. These benefits will principally include avoiding the muscular decondition-ing that is associated with neuromuscular blockade, and improving matching of recruitable lung volume with gas volume. In this manner APRV does not result in overdistension, because the patient can simply exhale or inhale to decrease or increase delivered gas volume to match the available lung volume. We were able to virtually eliminate neuromuscular blockade in this study after transitioning to APRV. It is currently unclear whether treating all ALI/ARDS patients with APRV will decrease duration of stay in ICU as a result of eliminating or minimizing the use of neuromuscular blocking agents. A prospective randomized study is certainly warranted on this aspect of care, given the current financial imperatives under which we practice. Intuitively, APRV should be a more comfortable mode of ventilation than any of the volume-limited or pressure-limited modes, because APRV is simply a CPAP derivative that allows spontaneous breathing. Therefore, one might expect to be able to decrease the amount of sedative agents used to achieve patient comfort and 'synch' with the ventilator. Our data support this hypothesis. Sedative use markedly decreased with the transition to APRV. The reduced dosage of sedative that is required to maintain a constant stimulated BIS value objectively support increased comfort (or decreased discomfort) with the transition to APRV. This aspect of care may potentially be characterized by the use of any of the numerous scales available to quantify patient comfort, and should be incorporated into future investigations. There were real benefits realized using APRV in this patient population, namely improved oxygen delivery with reduced pressor requirements. We titrated pressor infusions to achieve a mean arterial pressure of 75 mmHg or greater, warm extremities, and resolution of lactic acidosis (in combination with volume loading for volume-recruitable cardiac performance). Mean arterial pressure is an important parameter, because it is a physiologic end-point that the body defends with vigor. It should be noted that pressors are not used to treat hyperlactatemia that is not associated with acidemia. Almost half of the patients were successfully weaned off pressors when transitioned to APRV. The probable explanation for the enhanced cardiac performance with reduced pressor requirements stems from reduced peak and mean airway pressures. The reduction in intratho-racic pressure manifested as decreased central venous pressure. It is likely that these related reductions resulted in improved venous return and cardiac output. Patients were not further volume loaded or transfused packed red blood cells during the study period. Therefore, the increase in cardiac performance cannot be readily explained by volume-recruited cardiac performance or changes in oxygen-carrying capacity. With enhanced venous return, cardiac output increased as an expected result of increased left ventricle end-diastolic volume. Real-time trans-esophageal echocardiographic documentation of an altered left ventricular chamber size may document this process in the future. The improved hemodynamic profile led to a 36% improvement in oxygen delivery in this subgroup of patients relative to their oxygen delivery while on PCV. The present study does not address whether such a hyperdynamic state is beneficial. However, it is clear that if such a state is appropriate for a given individual, then APRV may represent a lower oxygen cost method (relative to pressors) for enabling the body to achieve that oxygen delivery. One should note that the patients studied here had their sedative infusions titrated to an objective criteria - the BIS value. This value has been well correlated with improvements in time to awakening from sedation in the operating room, as well as with decreased recall phenomenon in the operating room and ICU. It is likely that the sedative need decreased as patient comfort improved during positive-pressure ventilation by transitioning to a spontaneous breathing mode. It is also possible that the increased cardiac performance resulted from increased catecholamine tone as the patients awoke. However, none of the patients were fully awake during the study period; they simply required less sedative to achieve the target BIS monitored level of sedation. Thus, the increased cardiac performance is probably not an expected commensal of awakening. An earlier study in dogs with and without parenchymal lung injury  compared APRV with conventional positive-pressure ventilation, and assessed the hemodynamics. Unsurprisingly, conventional ventilation resulted in reduced blood pressure, stroke volume and cardiac performance, including systemic oxygen delivery. The results reported here closely support and buttress the animal data, although the ventilator modes were introduced in opposite orders. The lower airway pressures achieved with APRV have recently been cited [7,8] as an essential element in the care of neonates and pediatric patients with ARDS or congenital cardiac anomalies, and as an adjunctive support during extracorporeal membrane oxygenation therapy. Despite the recognition of reduced airway pressures (peak, plateau, mean), there has been relatively little data on the hemodynamic impact of APRV. The present study clearly documents the beneficial effects of APRV on cardiac performance in patients with severe ALI/ARDS. It is unsurprising that lactate levels remained normal, because these were well-perfused patients whose mean arterial pressures were held relatively constant. However, it is important that the measured lactate declined with the transition to APRV. Concomitantly, the increased cardiac performance was also reflected in an increased urine output as an indicator of improved end-organ perfusion. Although the SvO2 values demonstrated an increased trend, the difference failed to reach statistical significance. Because SvO2 is a global measure and reflects an amalgam of oxygen consumptions and utilizations from all of the perfused organs, it may fail to reflect cardiac index increases in already hyperdynamic patients. Alternatively, the increased cardiac performance may have increased perfusion to areas that were not maximally utilizing the delivered oxygen. The increased extraction ratio of these segments may have offset the expected increase in SvO2. An increase in extraction ratio with additional work has been identified in patients who were ultimately destined to fail a weaning trial . Because the present study was performed for only a limited period, it is impossible to comment with any degree of certainty on whether this mechanism was operative in our patient population. Nonetheless, there was a small increase in SvO2 in the patients on APRV, although this was not statistically significant. This small increase correlates quite well with an identifiable and statistically significant increase in urine output. It is useful to speculate on the potential financial implications of nearly eliminated neuromuscular blocking agent use, reduced sedative use, and diminished pressor use. Such cost savings may translate into real savings for a hospital. Additionally, nursing time is liberated, and may potentially be redirected to primary patient care and family liaison activities. Because a significant proportion of pressors utilized in this select patient population are used to support oxygen delivery, a PAC is also frequently utilized to guide such therapy. If the pressors are eliminated, then the PAC may also be unnecessary. This potential reduction in PAC utilization is probably real, because many PAC placement schemes require insertion of PAC for the evaluation of cardiac performance with high PEEP levels or elevated mean airway pressure levels. Each of these pressures are markers of increased intrathoracic pressure, increased pressure on the right atrium, and potentially reduced venous return and, hence, cardiac output. APRV may make such assessments a less frequent occurrence. Treating patients with APRV may seem at odds with the recent US National Institutes of Health ARDSNet study , as well as the closely related study of Amato et al . Each of these studies holds forth the promise of increased survival using a combination of lower tidal volumes, reduced peak airway pressures, permissive hypercapnia, and the elimination of lower inflection points on the static pressure-volume curve (as a guide to optimal PEEP). The common denominator is matching gas delivery rates, volumes, and durations to an individual patient's unique lung dynamics, including the dynamics of their chest wall and heart size. Each of the factors that are patient specific impacts on the volume of available and recruitable lung. The strategies suggested above are designed to avoid overinflating a given lung, with resultant volutrauma and biotrauma, while maximizing the recruitment of available alveolar units. This is the exact premise and promise behind APRV in a spontaneously breathing patient. The slow gas delivery rates and long Thigh times are designed to achieve better matching of regional time constant variations and to enable more uniform gas delivery to a greater number of alveolar units than is possible with conventional ventilation strategies. The patient's ability to exhale at any time ensures that, when the patient's lung volume is 'full', excess volume may be eliminated through an open and floating expiratory valve. In this way overdistension is avoided. A related strategy is constant flow ventilation, as championed by Slutsky and coworkers . However, constant-flow ventilation is hampered by difficulties related to carbon dioxide clearance in humans, and the resultant respiratory acidosis. This problem is eliminated by the release phase of APRV. Optimal recruitment of alveolar units is achieved by developing intrinsic PEEP with a short release phase, as well as through the principle of alveolar interdependency utilizing the pores of Kohn. Despite seeming disparity, APRV and the ARDSNet study have virtually identical goals that are achieved using different strategies. APRV may be safely instituted in patients with ALI and/or ARDS. In the present study population, utilizing the spontaneous breathing that is implicit in APRV substantially decreased the need for neuromuscular blockade and heavy sedation as part of a management strategy for hypoxemic respiratory failure, as compared with inverse ratio PCV. The lower peak and mean airway pressure with APRV lead to decreased transmitted intrathoracic pressure, and a reduction in the central venous pressure of patients with ALI and/or ARDS. The reduced intrathoracic pressure enhances venous return, and therefore cardiac performance, with a decreased pressor requirement to support mean arterial pressure and oxygen delivery. Further study of ARPV is warranted to discover its impact on resource utilization and outcome in patients with ALI. SvO2 = mixed venous oxygen saturation.